McCormick Assorted Food Color &amp; Egg Dye is a staple for creating beautiful baked goods and confections. Featuring four drop-control vials of vibrant food color in red, yellow, green and blue, this assortment allows for creating customized colors for a variety of baking needs. Food color is perfect for adding beautiful hues to icings, frostings and baked goods without altering the flavor. Or mix it with vinegar and boiling water for the perfect dye for decorating eggs. 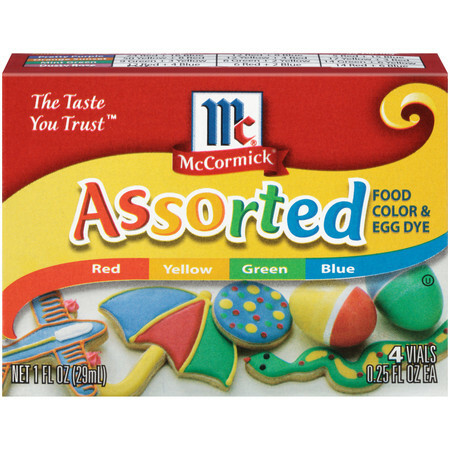 McCormick Assorted Food Color & Egg Dye is a staple for creating beautiful baked goods and confections. Featuring four drop-control vials of vibrant food color in red, yellow, green and blue, this assortment allows for creating customized colors for a variety of baking needs. Food color is perfect for adding beautiful hues to icings, frostings and baked goods without altering the flavor. Or mix it with vinegar and boiling water for the perfect dye for decorating eggs. I love Mc Cormick food coloring! I use it to make salt scrubs for friends and family and it never fails in giving me the colors I need! Even when mixing them together. Essential Item for your kitchen! This product was used in my household while I was growing up and now I use it when coloring food and for Easter egg dyeing. It is true to its color and doesn't seem to ever change the texture or consistency of whatever I am dyeing. The only con I see is that they need to include a little paper insert that has all of the different colors you can make. I usually have to go and find it on Pinterest. Great colors. Using it to make my smelly jelly. Can't go wrong with this purchase. Great price for teachers, too.